﻿Two days after Twitter told Congress that they aren't politically biased when censoring content, several prominent conservatives discovered that the social media giant automatically includes them in a site-wide "Quality Filter Discrimination" shadowban which prevents anyone not already following them from viewing their posts. While the filters have been around since August 2016 and were supercharged in May, Twitter's aggressive censorship of conservative accounts was noticed Thursday afternoon by the Daily Wire's Ryan Saavedra, after he said he saw reduced activity following a viral tweet with 3.85 million views in which Democratic Rep. Maxine Waters (CA) calls for attacks on members of the Trump administration. In short order, a flood of influential conservative Twitter users discovered they were shadowbanned also using an account checking tool at shadowban.eu. So I've been shadowbanned. It happened just a day after I livetweeted the Senate hearing on the censorship of conservatives on social media. What this means in practical terms is that newish accounts and anyone with the Quality Filter turned on (it's on by default and most people don't even know it exists) won't see most of my tweets, or the tweets of anyone else who's QFD shadowbanned. Looks like Twitter is shadowbanning @BreitbartNews' senior tech correspondent @LibertarianBlue. 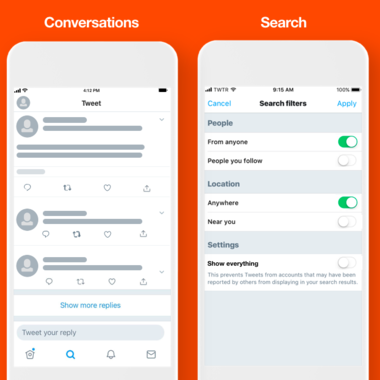 Twitter VP of Trust & Safety, Del Harvey, said that the filtering algorithm look at a number of signals, including how often a user is blocked, muted or complained about vs. receiving positive interactions such as "favorites" and retweets. "If you send the same message to four people, and two of them blocked you, and one reported you, we could assume without ever seeing what the content of the message was, that was generally a negative interaction." Harvey also said in a company blog post that the impact of the filters would affect "much less than 1 percent" of accounts. [L]ess than 1% of accounts make up the majority of accounts reported for abuse, but a lot of what’s reported does not violate our rules. While still a small overall number, these accounts have a disproportionately large—and negative—impact on people’s experience on Twitter. The challenge for us has been: how can we proactively address these disruptive behaviors that do not violate our policies but negatively impact the health of the conversation? To turn the default quality filtering off, go into your Twitter settings and unchedk the "quality filter" box. We wonder who Jack Dorsey thinks is having a "maximum negative impact on the conversation" right ahead of midterms?